Happy Friday friends! 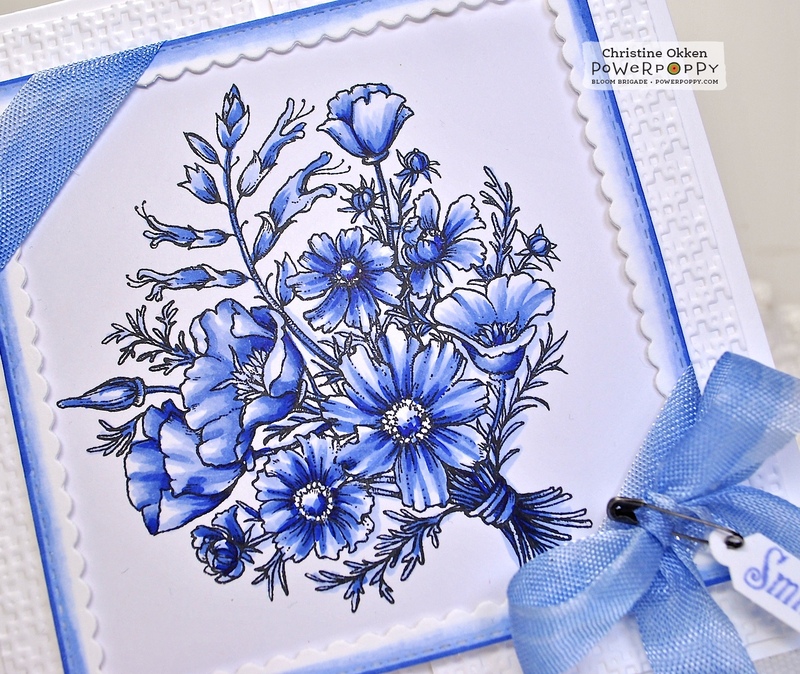 Today I’ve got another card to show off that works with our April Power & Spark Challenge that I’m hosting at Power Poppy. It’s all about colouring with ONLY three markers. There’s already some great cards entered, I hope you can try it out too! This week I went with a monochromatic design that showcases only three markers, B63, B66, B69. I love the delicate look to this Countryside Bouquet Deluxe. And blue and white make such a beautiful pairing. I stamped on XPress It Blending card stock, framed out the design with an MFT Scalloped die and added some swipes of colour to the framing to give it a bit of contrast. I also coloured up my white seam-binding with the markers so it would be a perfect match to the flowers. To give the white some more texture and contrast I ran the two small panels through an embossing folder and then added the little sentiment tag with a mini safety pin. 3. Or, for the courageous or expert: Pick three random markers and colour away! Remember only 3 markers! They can be alcohol-based or water-based, your choice. Use only 3 markers to colour! 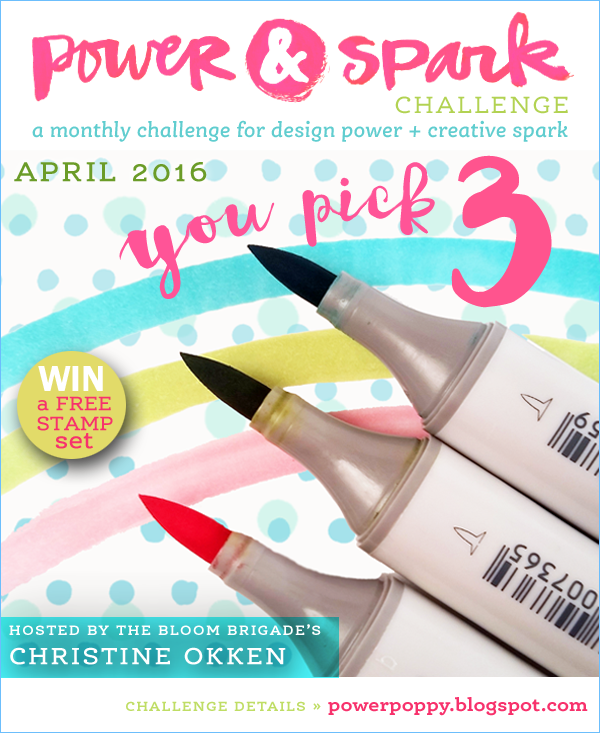 You could win a Power Poppy set of your choice just for playing, plus you’ll get to stretch your creativity and try something new! gorgeous card and flowers Christine I never heard of this challenge it's a difficult one. Christine, I love blue!! These colors are gorgeous, and I love the monochromatic look. The image is beautifully colored, and I love the layout with your embossed background and one of the new scalloped dies that has been "calling" my name...hehe! I love how you colored it and the ribbon too. Beautifully done, and I love it!! Hugs! 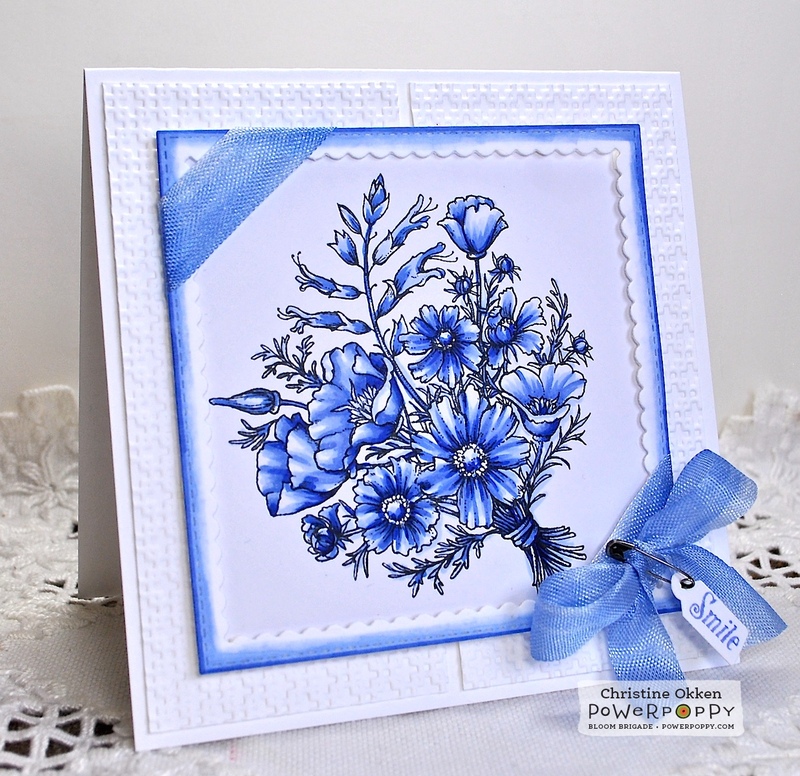 Beautiful card, the blue looks fantastic and your coloring is superb. Christine, this is gorgeous, and with only 3 colours! Beautifully coloured as always, love your embossed background, well lets just say I love it all! Fabulous! Beautifully colored and like the way you die the ribbon with the tiny smile tag! You do the most amazing work with only three markers, Christine! This monochrome is gorgeous! Just love this... blue none the less too. Gorgeous Christine! I like that you were able to use just the 3 markers, gasp!! I need to get started on this challenge too. eek! This is brilliant and one of my favorite stamps. Simply awesome!